Thank you. Thank you for helping us throw the best party of the summer and the best party of our lives. When Tyler and I started to create the vision for our wedding, one of the pieces we were especially adamant about was that we have a great cover band. A group that could help capture the attention and energy of every generation at the wedding - and with nearly 400 guests, we had about every possible generation represented. We wanted people on the dance floor the entire time. We wanted to answer the question 'How are we going to shut this party down?" and not 'How are we going get people out on the dance floor?". You guys delivered all of that and then some. You delivered the groom and father of the bride their first time crowd surfing. You allowed a close family friend to jump in on the drums. You brought my friends and me on stage for a dance party. You NEVER took a break (people are STILL in awe. It was literally the one thing that everyone talked about for weeks after the wedding.). The Salamanders added the magic to our wedding and got every single person out on the dance floor. You were amazing and we can't tell you how much we appreciated the energy, enthusiasm, charisma, and charm that you brought. It truly made our celebration one that people will remember. And most importantly, one that we will remember as one of the best, most fun days of our lives. "It was a pleasure meeting you all last night. I want to thank you again for the great concert last night at The Yellowstone Club! The event staff and food and beverage staff worked a very, very long shift and the music we heard last night made it the best work night ever! When you played AC/DC, we couldn't help but dance and sing at the top of our lungs!" You definitely were the hit of our wedding and it was so great that you were so willing to let our family come on stage and participate in the singing. That was amazing! Just wanted to shoot you a quick note before we leave on our honeymoon tomorrow early morning. Thank you again. You guys are INSANELY talented. So awesome." "WOW! What a night! Thank you all so much for your professionalism, talent and time. You made the Lohman wedding the event of the year! I cannot tell you how much positive feedback I received from the family and all of the guests. Clint (father of the bride) is still on cloud nine after his epic crowd surf. Thank you for allowing are guests to come on the stage with you, for play non-stop for over three hours, and for being so darn nice and accommodating. I have never worked with a band that was so perfectly dialed in and who I didn’t have to worry about! The ceremony, the sound, and the dance party was more perfect than I could ever ever imagined. Thank you for bringing your talent to Montana. I’m pretty sure Clint wants you back for his 60th Birthday Party in a couple years. So you will be hearing from me again. (Hopefully sooner!)" "You guys hit it out of the ballpark!! Seriously - people are still talking about it. so, thank you for making me look so good! My boss keeps telling me Rickae sang Pat Benatar better than Pat Benatar! I look forward to working with you guys again ..."
"I was at the -- wedding this past weekend and you guys were AWESOME!!! WOW. I have been to a lot of wedding, and you guys were by the far the BEST band I have ever seen at a wedding. GREAT JOB!!" "I wanted to reach out and just say THANK YOU! We love the Salamanders and just enjoy working with you, Rickae and the rest of the gang! You are always so fun and a delight to listen to! Thank you for being a part of our event, and our family!" "The Salamanders were beyond amazing this weekend! The dance floor was packed the whole night and everyone was so impressed by them." 'You guys hit it out of the park. One of our doctors I’ve known for 25 years. He is serious, even hard to get to smile, all of the time. He had a coat in hand after the dinner getting ready to leave and I told him he had to stay just a few minutes. At 10:20pm he is on the dance floor, hands in the air, screaming the lyrics of one of the songs with me. Never in 100 years would I have expected that. I’ll look forward to a Salamander event in the future. Thanks for making an evening I know as people go back home across the US and even other countries that they felt won’t be topped at any meeting in the future." 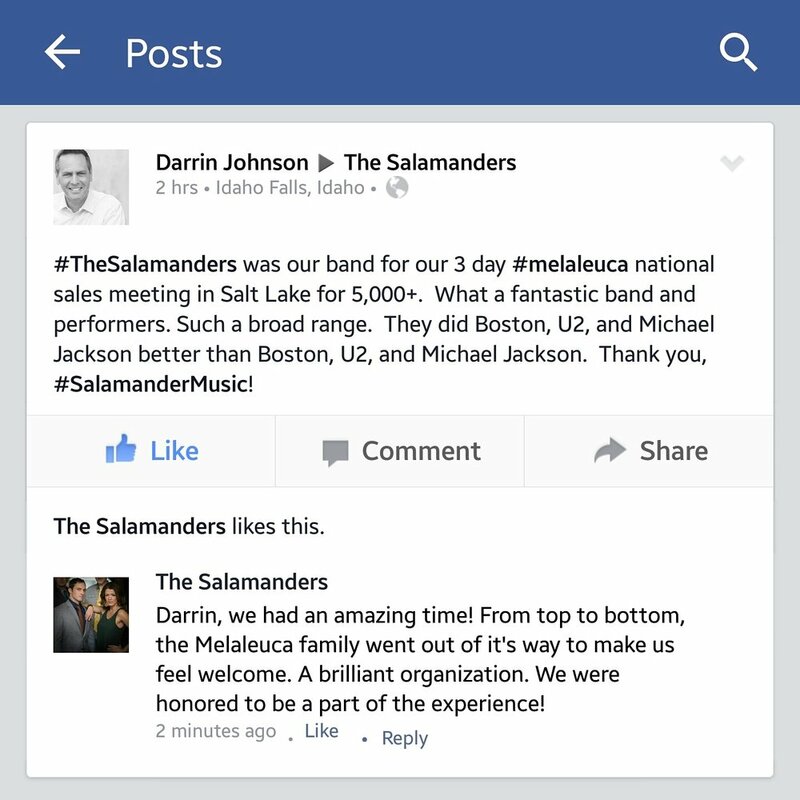 "I cannot begin to express the gratitude I have for the Salamanders Band. The raw talent combined with the band's passion and energy absolutely made their wedding reception a treasured memory. I will forever be grateful that your band was part of this celebration of love." "I just wanted to let you know what a great job you did on Saturday night. You were amazing! You are the best band we have ever had, and it is not even close! Our distributors had a blast! Thank you!!!!" "we love working with you! Always a pleasure and sooooooo much fun to have ya'll perform for our clients! Thank you for all you do!!!! "The Salamanders were beyond AMAZING for our wedding! Our dance floor was packed the entire night and they kept the energy going! Everyone is still talking about how unbelievable the band was, it was definitely a highlight of the night!!! BEST BAND EVER! The Salamanders surpassed every expectation we had - they made our night so amazing and fun...our guests refused to leave the dance floor and requested many encores :)"
"I wanted to say THANK YOU for everything. You and the band are simply amazing. And I sincerely appreciate all you do for us. We love working with you, and are such a talented group... Please pass along my sincerest gratitude for everything. "you guys nailed it! We can't thank you enough! You guys met and exceeded Megan and my expectations for the night. As a bit of positive feedback, the general consensus of all the guests was "how did you guys find that band, they were amazing!" The musicianship was totally on point, the horns were fantastic; the song selection and sequencing was incredibly fluid; you and your wife are great singers, bandleaders and have such a great stage presence. The whole night was just so much fun and you guys had everyone dancing for 4 hours!! We wanted it to be a fun wedding and you guys did more than your fair share to keep people dancing and having a blast. The biggest compliment I can give you, however, is my eagerness to recommend you guys to other clients or help write positive online reviews on your behalf. Please, please don't hesitate to use me and Megan as a reference for future events - very eager to do so. And let me know which websites would be helpful to submit reviews to sing your praises. Last but not least - I can't thank you enough personally for your professionalism through the process of working with the band - you were prompt, accommodating, and very positive in all of our interactions. I just wanted to let you know that those qualities were not overlooked and very much appreciated during the stressful process of planning a wedding. Again, thank you and let us know if we can help in any way. "I want to extend a huge thank you to The Salamanders for their performance at our 75th anniversary party last night. They were INCREDIBLE!! They had amazingly high energy and kept people on the dance floor with hit after hit, executed perfectly. I had multiple people ask, "who are there guys?!" And "they're local?!" We had more people on the dance floor last night than at any other event in our history. We also appreciate the band's professionalism in timing and set up. They were terrific to work with and I hope we are able to work with them again in the future!" "You made our evening. Everyone I mean everyone said it was the best and funnest band they had ever been to. Also that singer was outstanding and what about the guitarist YEAH Thanks again." "I just wanted to say that you guys rocked. We loved the band and Sleepwalk was perfect. Thank you so much for making our night so much fun. I had a lot of people tell me that you guys were the best band they had ever heard at a wedding and I agree! "Salamanders were a top notch band. I had so many compliments from the group... I would fly this band out to any event either locally or nationally. AMAZING group of musicians." "Your band ROCKED! We are so thankful you guys played for Alexandra and Dan's wedding! Everyone is still raving. The joy, energy and pure fun everyone shared was amazing. The dance floor was filled all night long. We heard so many great compliments of The Salamanders: "best dance band ever"; "best party music"; "epic"!! Everyone loved Jordan on the Michael Jackson songs and so many others. And Rickae still dancing 4 hours later!! Jordan and Rickae absolutely nailed the rendition of Wonderful World. Gail had tears by the first measure. Thank them again for us! So beautiful. Your hard work and generosity is very appreciated. We will book and see you in Seattle sometime! "Picking a band when planning a destination wedding was probably the most difficult vendor decision we had to make! While they all have videos available on line, it's difficult to tell the vibe and energy. Utah Live was able to give us the information needed to help us make the right decision for us, which was definitely the Salamanders! We wanted a band that could play wedding classics, along with hits from today and keep the dance floor moving all night- they ROCKED it! No exaggeration, people are still talking about our wedding band. The band sets the tone for the night and our gets had the best time thanks to them! I can't wait to throw another party and have them play. THANK YOU for making our wedding night the most fun EVER!!!!" "I asked my staff members to each start looking for a band to perform at our City Celebration concert. Over the next month, each one came back to me with a recommendation to book The Salamanders. For 2 months I asked them to continue to research other bands that might be equal to or better. Always the answer came back,” We want the Salamanders” so we booked them with high hopes. Let me tell you something, they were better than advertized! From start to finish, this talented, high energy and fun band were outstanding. They performed today’s hits as well as yesterday’s favorites from Country, Pop, 80’s and 90’s, rock, from Bruno Mars to Boston, Journey to Bon Jovi this band’s set list is amazing. Do yourself a favor and book the Salamanders for your next event. You won’t be disappointed. Again, you folks are AWESOME! I am especially thankful for your extending when my fireworks guy wasn’t ready. I will talk you guys up to all my City Celebration colleagues. NOBODY PLAYS BOSTON!" "Everyone has commented that they have never seen a bride dance "all night long" - - -with no breaks, not leave the dance floor, no bouquet toss, no garter removal, no stopping the fun! And the band never stopped either!! Great energy! "You guys were amazing ! Thanks for a MOST enjoyable time in Sun Valley this past Sunday evening. The whole week was really fun leading up to the wedding, and you guys just sealed the deal. You were so personable, too - who knew that you were so well known! Amazing, great job guys!" "Thank you so much for everything you did for the event. The band ROCKED and everyone absolutely loved them. Please thank them for being awesome and flexible in the crazy weather. Hope to work with you again in the future!